Thank you for visiting the Orlando PTRC Patents Research Guide. Check out Assistance at UCF to see what services we are able to provide. Each category to the left points to specific information related to patents and other intellectual property. If, after reviewing this site, you have general patent questions not adequately covered in this guide, consider contacting the Inventors Assistance Center (IAC) at 1-800-786-9199, press 2 for patents. You will first reach an automated system of pre-recorded messages that answer frequently asked questions. If you do not find the information using the automated information system, your call will be forwarded to a USPTO Contact Center (UCC) operator. The UCC operator will provide answers to basic, non-technical questions and transfer calls to the IAC as necessary. If you would like to make an appointment, first contact Missy Murphey, the PTRC librarian, at rebecca.murphey@ucf.edu (email preferred) or 407-823-5308. Please contact Missy before visiting the UCF Library for patent assistance. 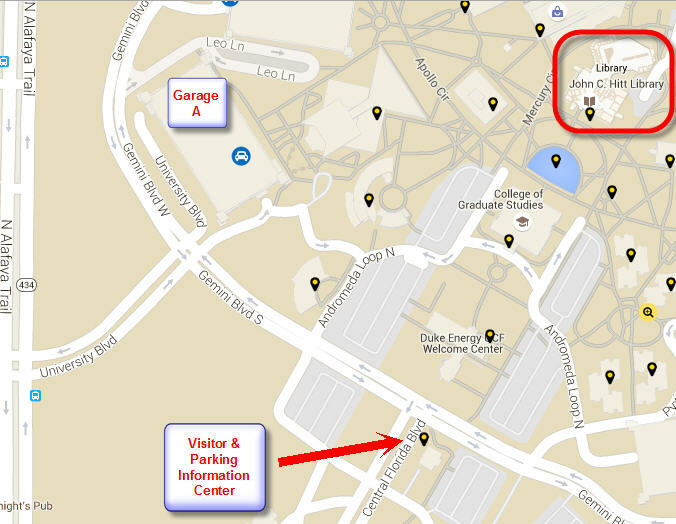 If you are driving yourself and using a GPS to locate the UCF Main Campus library, use the Visitor & Parking Information Center address: 4000 Central Florida Boulevard, Orlando, FL 32817, where you can obtain a parking pass for the day. Do NOT use the specific street address for the John C. Hitt Library because the GPS navigation will take you around the back of campus to get to the library's loading dock where there is no public entrance and no public parking. If you are driving yourself and using a GPS to make a delivery or pickup at the library's loading dock, use the address: 12701 Pegasus Drive, Orlando, FL 32816-8030 to get directions around the back of campus to get to the library's loading dock. NOTE: There is no public entrance and no public parking at the loading dock. $5 Daily Permits - available at the Visitor & Parking Information Center or at any pay station throughout campus. The pay stations accept cash (no change given) or credit card.